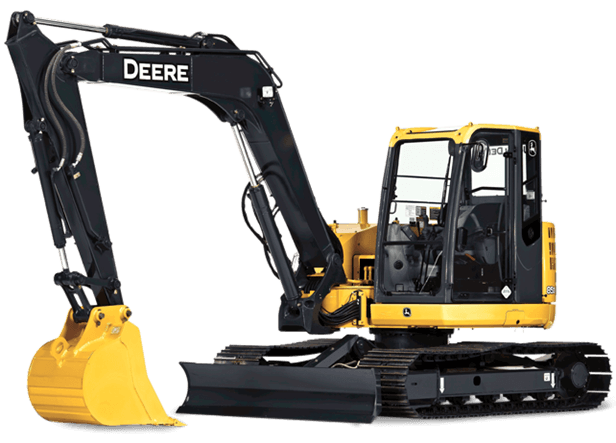 With a John Deere 85D Excavator, you get big productivity and uptime from a medium-sized excavator. With the smooth power, exacting control, and easy operation of larger John Deere excavators, they're exceeding all contractor expectations. When you depend on your equipment to get the job done right on schedule, downtime is not just a downer - it's not an option. That's why the 85D is built from the ground up to deliver unsurpassed reliability - from their durable sealed and lubricated undercarriages to their rugged fuel-sipping diesels. Other uptime-boosting features include tungsten-carbide thermal-coated arm surfaces, oil-impregnated brushings, and a highly efficient, heavy-duty cooling system that keeps things running cool, even in tough environment or high altitudes. When you know how they're built, you'll run a Deere.